I have been celebrating Dr. Seuss's birthday with my daughter since 2007. We have made birthday cakes to eat while reading The Cat in Hat. We have traced our feet on construction paper, cutout the footprints, and placed them all over the basement while reading The Foot Book. 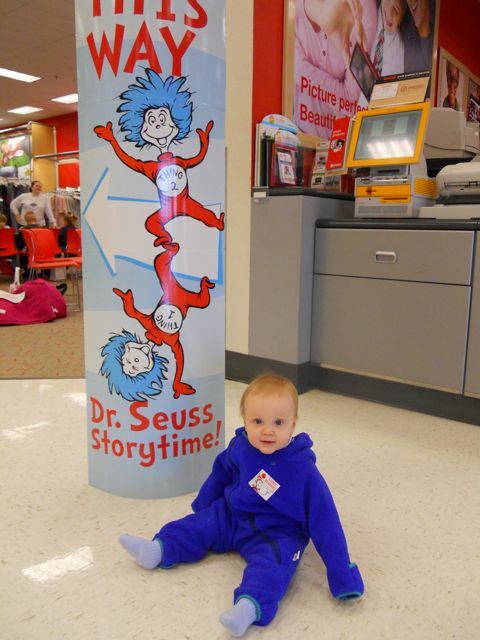 This year we started off our celebration by attending the Dr. Seuss Story Time at Target, a proud supporter of the NEA's Read Across America event. My children received a goodie bag upon arriving with a juice box, snacks, crayons and activity sheets. Also, there was a table covered with coloring pages, stickers and crayons. Once a crowd of about 12 - 15 families arrived the Target employees took turns reading books by Dr. Seuss. We stayed for about three books and then proceeded to do some shopping. When we were finished shopping my daughter insisted upon returning to the Story Time area. Families were still arriving at the event and the employees were still reading books! I was very impressed with the Target employees and the efforts they put forth to promote reading. We will definitely try to attend this event next year. My kids loved the coloring table. This was a great activity even for my youngest! This year we wanted to read books by Dr. Seuss that we hadn't read before like The Butter Battle Book, The King's Stilts, And To Think That I Saw it on Mulberry Street and Bartholomew and the Oobleck. I found that I enjoyed reading these books just as much if not more than his books with tongue twisting rhymes. Our favorite book in this group was Bartholomew and the Oobleck. I thought it would be fun to make our own Oobleck to celebrate Dr. Seuss's birthday. The kids were amazed that we could actually make it; something that almost destroyed the Kingdom of Didd! All we needed was water, corn starch, and food coloring! The oobleck mixture is so strange and COOL! It pours like a liquid, but when squeezed it becomes solid. I found a great video of Oobleck on the MythBusters show which I embedded below. We watched this video before making the mixture and it gave my kids a great introduction to what they were about to make. 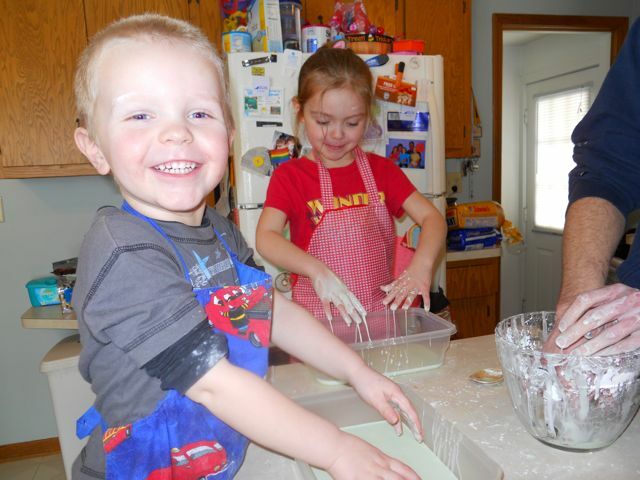 Be prepared, if you watch the following video your child may say, "Can we fill a swimming pool with Oobleck?" as my daughter did! 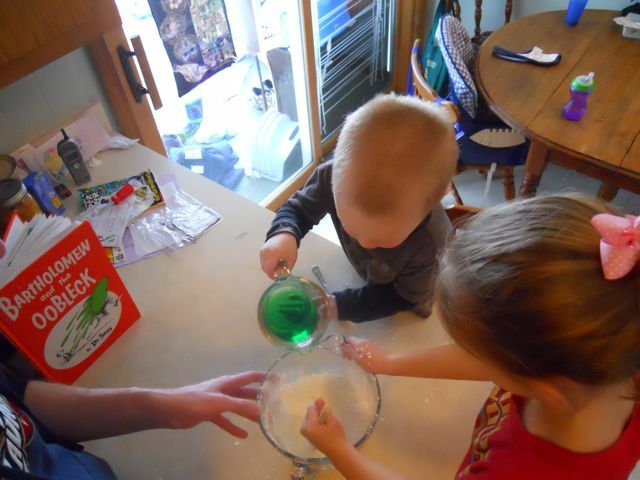 First, we added the food coloring to the water and then added it to the corn starch. Once the water was added I took over the mixing from my daughter because she said it was too hard. Aprons were necessary with this activity. 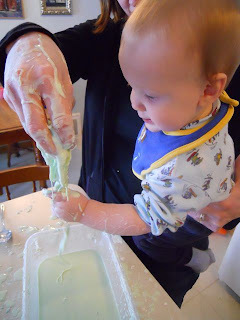 It was fun to squeeze solid and then let it ooze out of our hands. My daughter said, "Is this science?" 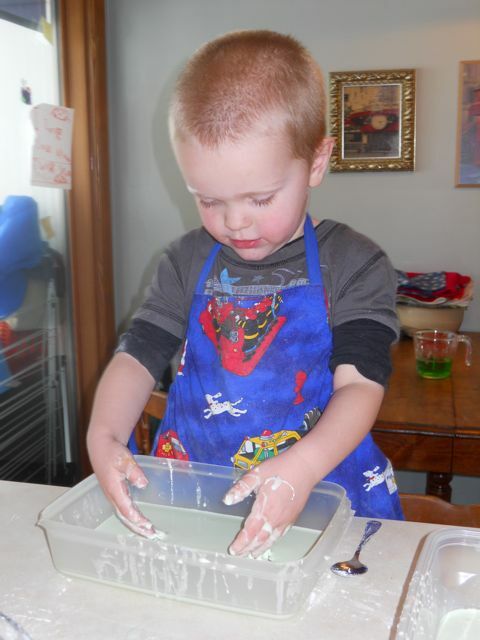 The more we worked with the Oobleck the better it got. We may have had just a tad too much water to begin. We even got my little one involved in this project. The aftermath - messy, but cleaned up pretty easily with a spatula by scraping everything into the container. I hope everyone has wonderful day reading on Dr. Seuss's birthday. I get so excited hearing about how schools and families celebrate reading on this day. I would love to hear your stories! 4. Seussville Read Across America info - Printable Certificates, etc. Happy to be celebrating Seuss with you! Thanks for visiting our site! Oh so much fun!! That's what days like this are all about. Thanks for visiting my blog and leaving a comment. Please come back again!! I am so glad that I found your blog. We have similar interests. I love reading books with my kids and then cooking up yummmmy treats based on the books. We also went to target to celebrate Dr Seuss's birthday and we are baking cupcakes tomorrow!! Visit me at www.thehokeypokeykitchen.com if you get a moment!! Thanks for sharing your ideas... the goo looks soooo much fun!!! What a SEUSStastic idea! I love your gooey Oobleck. 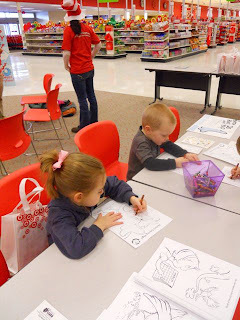 Fun you made it to the Target event. I’m adding a link to this on my children’s book blog where I collect Dr. Seuss ideas. Thanks so much for sharing your post at Living Montessori Now! 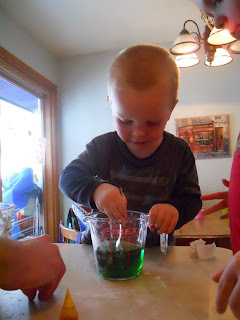 What fun activities you did for Dr. Seuss's birthday! 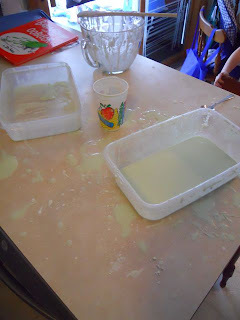 Great to hear how the Target event was - and thanks for sharing the Oobleck recipe and other links and resources. I added your post to the Living Montessori Now Community at http://livingmontessorinow.com/community/#/1378313/forum/82423/how-are-you-celebrating-dr-seuss’s-birthday-with-your-children-and-or-students.html By the way, I love your blog and am your newest follower! I love your site! 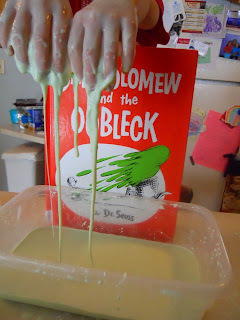 I love the oobleck - that's definitely one I want to try. My brother left the following comment on my Believing In Horses blog today after reading your comment regarding the activities to accompany the book. He's not a bog blogger (yet! ), so I thought I'd cut and paste it for you here since he is so enthusiastic. "Dear Eric, My sister, Valerie Ormonnd passed along your comments on the activities association with Believing In Horses. Thank you for the kind words and taking the time to review “these valuable resources.” I hope you are able to make use of them, too. The teacher part of me just couldn’t help scribbling notes about corresponding activities, comprehension questions and vocabulary words in the margins of the first manuscript my sister had given me to read while I awaited Jury Duty selection. I happily scrawled notes for two days but, sadly, was one of the many not chosen to participate in this civic duty. I guess waiting counts, though! A bit more about government, if I may. I was very honored to help my sister bring her books to the Maryland State House and speak with Senator Reilly. The Senator made both of our hearts leap after his aide asked him to step away and take a picture with the “Cat in the Hat” and indicated he would do that later because my sister “was the important person right now.” In this manner he showed us his constituents came first and validated our sibling belief that there is good in government. That day, his name was Ed Reilly. P.S. You’ve got to read the book to find out how much more moving the moment was for the author! 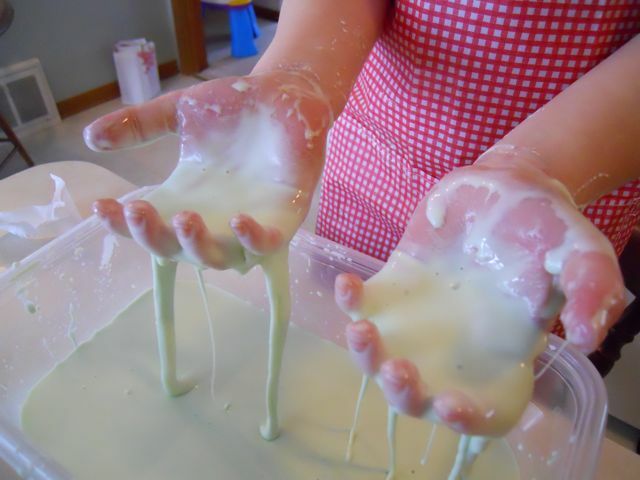 What fun you had with the gooey oobleck! I love your site! 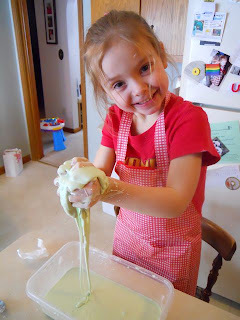 Iza -- Have you made oobleck? It is the coolest thing! I am so glad you like the site!